Part 1 - Basic Knowledge, is available to order individually or as a 2-book set along with Part 2 - Practical Production. The author, Per-Erik Persson, produced the books after identifying a great need for an up to date harvesting book for the forest industry. He has a forest engineering degree, but is also a practitioner with life-long experience of forest production and has been in charge of training and numerous courses in the forest industry. The educational approach of each book is reinforced with numerous photographs, illustrations and drawings. Working in Harvesting Teams Part 1 should be seen as a platform providing all the knowledge an operator must acquire before he starts driving a forestry machine. Some important chapters focus on the working environment, communication and social skills, while information in the chapter on driving technues is essential for good productivity. In addition, extensive information is given about crucial elements of planning harvesting, including a new system for classifying carrying capacity. 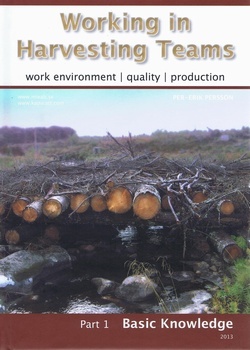 Contents for Part 1 include: Work Safety; The Work Environment; The Machine Operator, Responsibility, Social Competence and Team Spirit; Communication; Care of the Machine; When Fire Strikes; Water Conservation; Reading the Terrain; Basic Driving Technique; Getting Stuck; Planning a Harvesting Operation; and Scaling Regulations.